European Bank Stress Test: "It’s not that 8 failed…but that 82 passed!!" The European Banking Authority announced Friday that 8 banks had failed their stress tests and 16 more had narrowly passed. But the results drew much criticism from analysts, who said that the stress test is not strict enough. Indeed, this is something that European Financial Forecast readers have known since the first stress test last summer. For a unique perspective on Europe’s sovereign debt crisis, we invite you to read a free 6-page report by Elliott Wave International’s European Financial Forecast editor Brian Whitmer, "Credit Crisis in Europe." Brian has been anticipating and tracking the credit contagion across Greece, Ireland, Spain, Portugal and other EU nations for months. Below is a quick excerpt from this report, written just after the first stress test. For details on how to read it in full now, look below. The market’s collective sigh of relief is also reflected in authorities’ stress testing of 91 European banks. In case you missed last Friday’s results, their message is clear: relax. The Committee of European Banking Supervisors (CEBS) gave passing grades to nearly every bank on its list. The group, for example, passed both Irish banks and all four UK banks that it evaluated. The CEBS gave clean bills of health to all four Portuguese banks, all five Italian banks, and five out of six Greek banks that it analyzed. Even with share prices that sit 29%-66% beneath their 2009 countertrend highs, the CEBS says that the Bank of Ireland, Piraeus Bank, Banco Popolare, and Banco Santander are all in good shape. In fact, just seven of the 91 banks failed to make the grade. Five were in Spain, one in Greece, and one, Germany’s Hypo Real Estate, is entirely owned by the German government anyway. Everyone else — 84 institutions in all — are supposed to be strong enough to withstand another economic shock. It’s not so much the stellar results that expose the optimism of a Primary degree rally, but rather the Banking Committee’s stress tests themselves. They are notable primarily because they failed to test for any real stress in the first place. 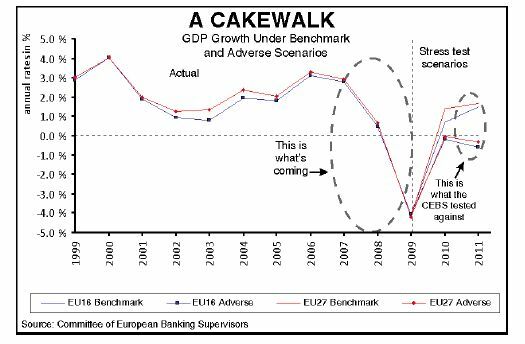 As the chart shows, the Committee’s "adverse scenario" regarding economic performance assumed a mere 3% deviation from the European Commission’s GDP forecast. Another test looked at banks’ resilience to a sovereign risk shock, yet the analysis merely used conditions similar to those of May 2010. In other words, just like the UK budget office, the CEBS is utilizing a woefully diluted version of the economic deterioration that is about to grip the continent. FREE REPORT: Discover what Europe’s debt crisis means for the future of the continent and your investments. Get your FREE 6-page report filled with unique analysis on Europe, the PIIGS and the sovereign debt crisis. EWI’s European Financial Forecast editor Brian Whitmer gives you the context for what’s happening in Europe and gets you up to speed on the reality of the situation. Download your free report now. This article was syndicated by Elliott Wave International and was originally published under the headline European Bank Stress Test: "It’s not that 8 failed…but that 82 passed!!". EWI is the world’s largest market forecasting firm. Its staff of full-time analysts led by Chartered Market Technician Robert Prechter provides 24-hour-a-day market analysis to institutional and private investors around the world.